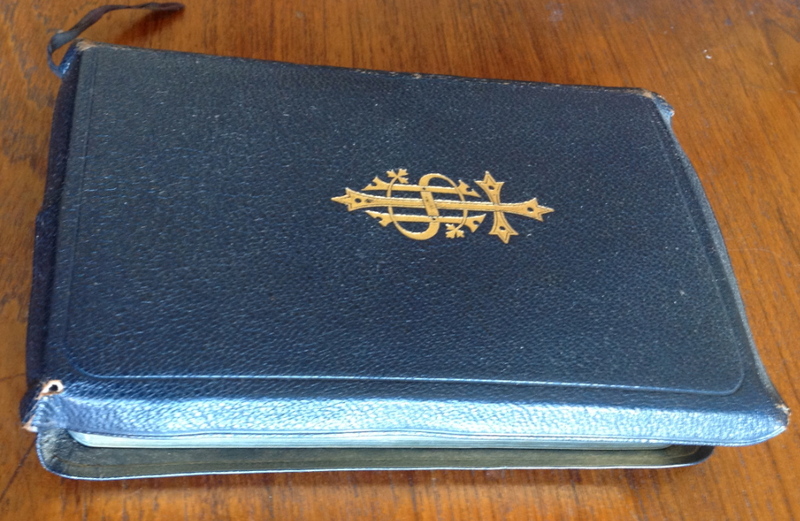 On 30 April 1936 my father, John Aubrey Hollick, received this yapp-edged blue morocco-leather-bound volume entitled The Liturgy and other Divine Offices of the Church. It was printed at the Chiswick Press Ltd., New Southgate, London and they appear to be the publishers too. His name is handsomely inscribed on the fly leaf followed by the date, and added below in a different hand, in a light pencil, the words “from his father”. 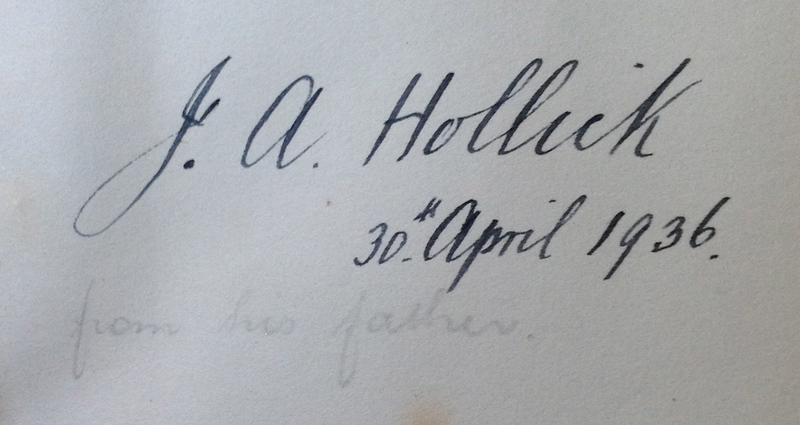 This Liturgy would have been my grandfather, Walter John Hollick’s gift to his son on the occasion of his 23rd birthday. The inscription is in his hand. Now it came to pass that on the 20th of January that year King George V had died and his eldest son acceded to the throne as Edward VIII. Everyone must be familiar with the shabby story of the new King’s wish to marry Mrs Wallis Simpson, an American who had divorced her first husband and was now seeking divorce from her second. Such behavior was deemed by the government to be un-king-like and Edward was eventually forced to abdicate in favor of his brother. The heft of Edward’s mind may be indicated by his insistence that he face left (as his father had done) on coins minted during his reign, in order to show the parting in his hair, which he rather admired, although traditionally on British coinage each successive monarch faces in the opposite direction to his or her predecessor. 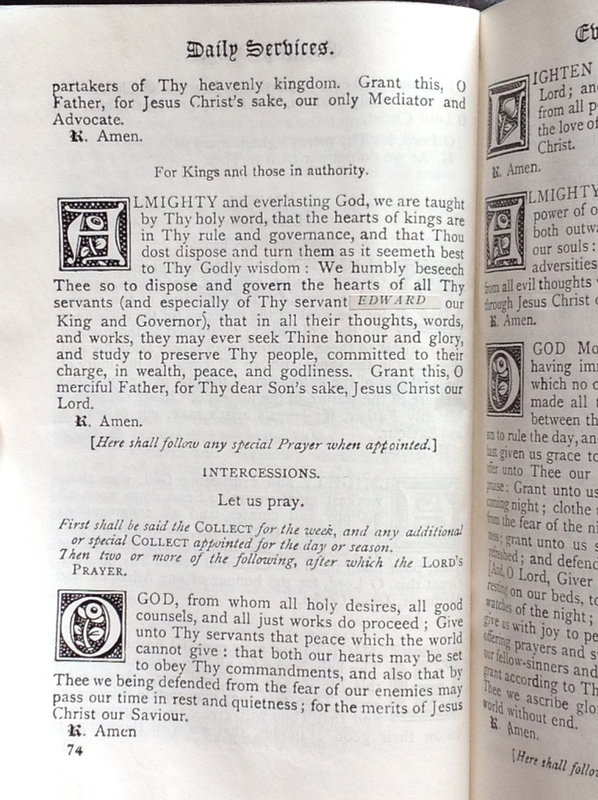 In Church of England prayers the monarch is from time to time mentioned by name. When King George dies, all the sheets you have on hand become obsolete because there’s obviously little point in praying for the health of a monarch who’s just left us. I assume that the Chiswick Press kept sheets on hand, unbound, as all publishers of Bibles and Prayer Books did and still do. You print long and bind short in this business. Nowadays you’d curse and waste the sheets with the offending name — quite a lot of the sigs would be salvageable as the volume contains full Psalms and Hymns in which our terrestrial monarch is not referenced. However it’s an indication of the changed relationship between labor cost and paper cost that the Chiswick Press opted to print up little patches which they pasted in over the word GEORGE, conveniently similar in length to the new King’s name. In this photo you can make out the little patch about a third of the way down page 74. The correction process was not wholly successful though: on page 14 a patch is needed as we still remember George and his gracious family before the Lord, but it was omitted. I wonder if this means that they missed that correction across their entire sheet stock, or that the apprentice charged with the paste-up just missed page 14 on this copy only. It doesn’t look like a patch fell out. It’s possible that these patch corrections were made to an already-bound book, but I think that would probably even then have been handled by a rip and tip: it’s just easier and neater to replace the whole page in a bound book. 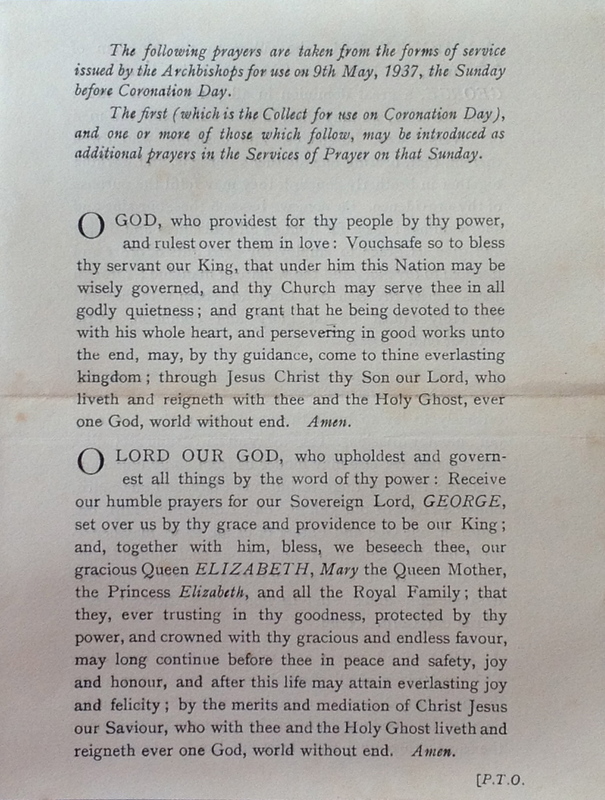 Also enclosed in the book is a single sheet bearing prayers for the next coronation, of King George VI, in May 1937. What turmoil: having to correct your books then correct them all over again. Queen Elizabeth has done prayer book publishers a great favor by reigning for over sixty years. The capitalized one on this sheet is of course her mother. Pasting patches wouldn’t be done nowadays — the skills are just no longer available to book manufacturers. In the olden days a bindery employee would have gone through an apprenticeship or thorough training where skills like this would have been drilled into his (or her, as the bindery was the one area where women were employed) young head. For instance any printer/binder would in the old days have been able to do a rip and tip: now we send them off to the “book hospital” where some of the old handwork skills are still to be found. I wonder about that pencilled addition “from his father”. Who would have written it? Not my father: he’d not be needing reminding of who gave the book to him. Maybe his mother; making clear to him that she’d bought him a less-impersonal gift? I doubt that too. I think it was probably added by his sister, going through his things after he died. I believe she added these words so that I, at some point in the future, would be able to reconstruct this act of memory, which, having just received the book earlier this month, I am proud to do on this, the 102nd anniversary of my father’s birth, and shortly after the 70th anniversary of his death — on the 2nd of March 1945 in a Japanese POW camp. Very nice story, with several agreeable morals. And I never knew that about successive royal heads on coins alternating their direction of gaze and the petty vanity of Edward VIII. Thanks for your kind remarks. George VI looked left, just like Edward VIII and George V, i.e. he ignored his brother’s vanity and kept to the left/right rule.